Now, most of the people who regularly use social networks don’t know about the history of the web. Ask some non-CS friend, and they’ll tell “Hey, there is Facebook and Google and what not, so they’re called the Internet, right?” Well, he/she probably has a point, but still, we have to admit the evolution to see what is coming next. We, regular users of Web 2.0 sometimes do wonder: What can be built upon what we have right now? Well, there is the obvious Semantic Web, which people are expecting it to arrive almost for two decades now. I’ll ask you more: what about 4.0? What will be next and when will it arrive? Obviously, the next big thing. I also performed a Google Trends search and an n-gram search, because the numbering system of the web seemed so interesting. There were only webs ending with point oh. For example, Web 2.5 was not a common topic. Even on wikipedia, there is a web 2.5 article only in Spanish. I also wanted to see general trends about this numerization. Please have a look at the results. The decline in the Web 2.0 related news is quite obvious through years. In the next search I dropped Web 2.0. 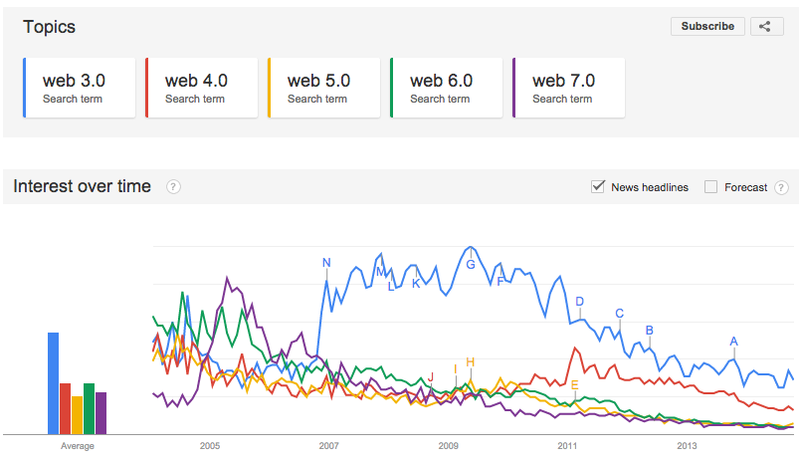 Web 7.0 has a peak in April 2005, and that is related to a java library named something-web-7.0. 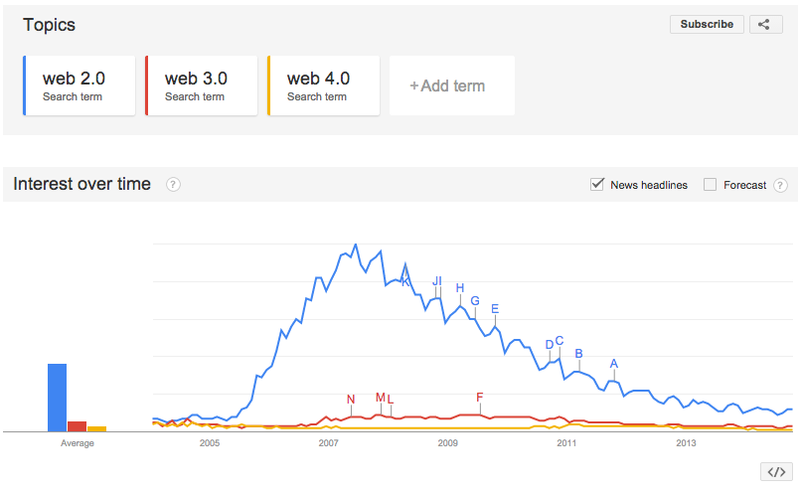 Other than that, Web 3.0 is clearly visible after 2007 and the same thing goes for 4.0 after 2011. It looks like this: While we were already talking about Web 3.0 for a while, at 2007 we started talking much more about it. Same thing goes for Web 4.0 on 2011. Can we say that when we realize that “we’re using Web 2.0 for x many years” we start talking about Web 3.0? And maybe the same for the 4.0 as well? Well, as I argued above, I do not believe it will arrive like a train arriving a station. I believe some applications will start to make use of new things, then we’ll realise and talk more about it. Unfortunately, there were not many information coming out of n-gram database. So what is the definition of the Web 4.0? I came across a paper written by CmpE Faculty of University of Isfahan, which mentioned Web 4.0 for three consecutive paragraphs. It ended by saying that there is no exact idea about what we want to call Web 4.0, but it will likely to use AI. It gives more clues by saying that it is to be called “Symbiotic Web.” So the machines will be co-operating with humans. This sounds pretty cool, except, I thought there are several examples where machines are already co-operating with humans. It might not be as futuristic as authors had in their minds, but it brings me back to the point: transition is a smooth process. We’re at the transition period, and there are some applications that fits the common definitions, even partly. I’ll try to throw in some examples. 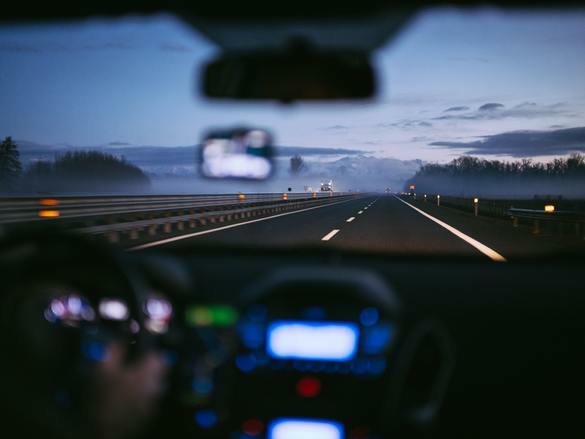 Autonomous cars may seem like a new concept, but they are being researched on since 1920s. Google already has a working prototype and most car companies are working on the topic. The concept is simple (from the viewpoint of the end-user), you just tell it where you want to go, and machine takes you there. It makes use of, you guessed it right, the data. The big data. Maps, traffic, camera, lasers, heat sensors and more. Data -which has a a meaning and a lot of connections- is brought together to arrive at some decisions. So we can say that data has a sense, and it’s being used to produce an action. Building on the examples mentioned on this blog, we can think of the Web 4.0 working on an agent (without specifying the agent, might not be a computer, might not be a smartphone as well) that can tell you “Your plane is cancelled, but don’t worry, I booked you a seat from the next plane and told the people (or their respective agents) that you’ll be late. You have one more hour to leave home, then we should be on our way.” This might seem like a dream right now, but it’s not that far. I don’t want to sound like a advertiser, but Google (again) has an app for that, called Google Now. 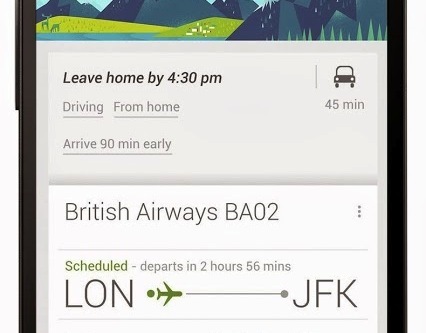 It tells you when to leave, by looking at the traffic data and flight status. This looks like the definition above. It shouldn’t be too hard to update this application to say that “Hey, your self driving car will be waiting for you at your door in one hour, be prepared.” The same application can remind you of your bills, events, or even shippings right now. Imagine what similar applications can do just a few years later on. But as I mentioned above, it seems like it wouldn’t be good to wait that “uh-huh moment”. It looks like the process of transition has already started. Let’s just hope that their bubbles do not come soon. Before leaving, I strongly recommend for you to have a look at the Physical Web project.